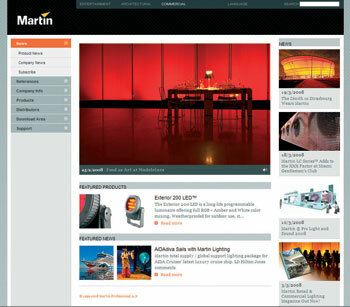 Martin Professional has given its www.martin.com website a thorough makeover. The new look site, optimized for bigger bandwidths and wider screens, features an enlarged format with bigger images, expanded segment pages and a brighter appearance for greater clarity and visual impact. The easy to navigate site features regularly updated product and industry related news, together with extensive information on the entire Martin product range including technical specifications, pictures and video clips.